Over the last 15-20 years, educational researchers have studied the impact of online environments, technology in classrooms, and applications that support teachers. The transfer of knowledge in online environments (Merges 2011) sets a framework that could be applied to research in AR & VR as collaborative environments become available. Electronic environments offering a shared portal for multiple users afford teachers and researchers the opportunity to study group work among students. 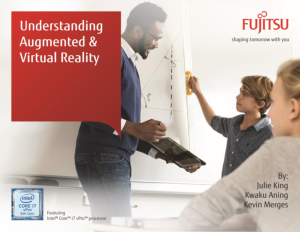 To find out how Fujitsu could help enhance your AR & VR solutions download this whitepaper today.